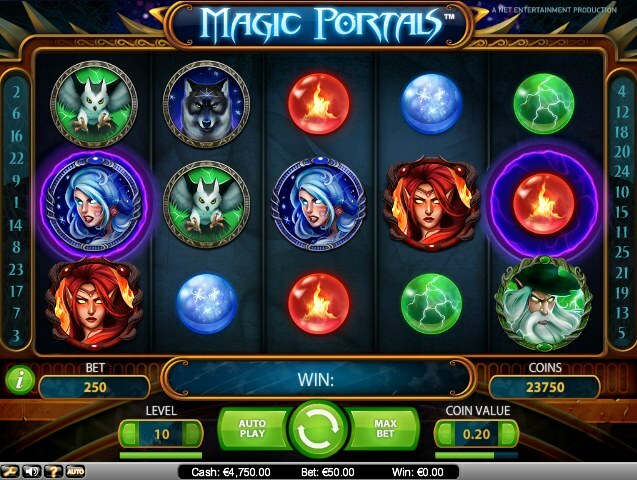 Magic Portals is a release from the NetEnt-developed stable and received a lot of hype before it enjoyed its anticipated release in August 2013. Does it still stack up? First things first, this is a 5-reel, 25-payline game with a mystical theme that will have fans of IGT’s fairytale-themed Diamond Queen and the underrated Enchanted Unicorn from the same developer chomping at the bit to get their hands on this slot. Symbols in this slot are all based on things that you would associate with the magical and mystical including wizards, warlocks, witches, owls and wolves. The whole atmosphere of the slot has a very alluring and enchanting vibe about it. Now, Magic Portals was drawing a lot of attention pre-release because of the inclusion of the magic portals spaces on the reels. NetEnt had decided to take the Wild and Scatter symbols and make them more dynamic. There is no set Wild in this slot as such. Instead, you have one magic portal space on Reel 1 and one magic portal space on Reel 5. If a symbol appears on both of these magic portal spaces on the same spin then that symbol turns Wild. In addition, any of identical symbols that have appeared across the reels on that same spin will also turn Wild. You can imagine the potential payout carnage and the number of winning combinations that can be completed because of this. The magic portals are not only influential when it comes to the Wild symbols but also the Free Spins symbols. The free spins bonus round is triggered if you manage to hit Free Spins symbols in both magic portals spaces on Reels 1 and 5 simultaneously. 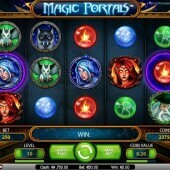 You will instantly be handed 10 free spins and another two magic portal spaces will appear on Reel 5. There is the potential to re-trigger more free spins by landing the Free Spins symbols in the magic portal spaces during the free spins. Magic Portals is all about the name. The magic portals in the slot play such a key role and it’s great to see NetEnt taking on a new angle for a slot. It is exciting because carnage is just around the corner with every spin and the unpredictable nature of this slot makes it very exciting. Players that have enjoyed recent NetEnt releases such as the intergalactic war-themed Space Wars and the hilarious EggOMatic will really want to give this slot a try.